I have just made a change and moved what was the main/home page to it's own section now called Links - local and beyond. This means that I can now make this front page more dynamic and hopefully more interesting. Check out Aim Archery - the south coast's newest archery shop! Only 18.5 miles from Firle field. 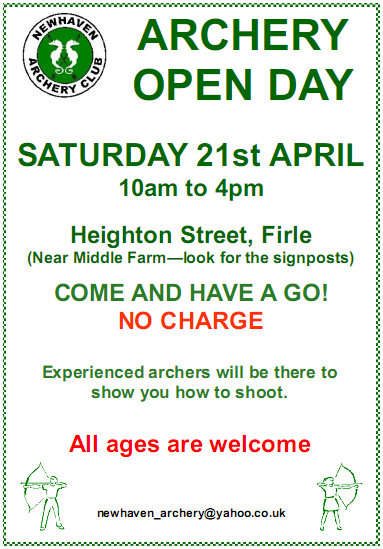 Next up, let me announce the Newhaven Archery Club 2012 Open Day - Saturday 21st April from 10am to 4pm. Hopefully it won't rain, but we only cancel if it's really pouring down. This is the build-up to our next Beginners Course which for this year is being run over 2 consecutive weekends - 19th & 20th May and 26th & 27th all 2-5pm. 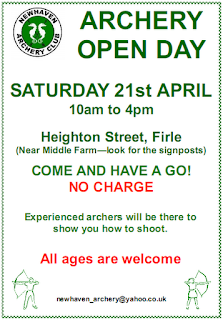 More details may be found on the NAC website and by contacting the Club Secretary - newhaven_archery@yahoo.co.uk. I'll be there at the Open Day and the training, so do come and find me. Finally, if you are a club member, even though not officially started, some of us are going to the field evenings and weekends. I like to go Tuesday and Friday evenings, and if I know someone else will be there, I go Saturday or Sunday for a couple of hours as well. I try to make the most of the weather, but as you know, we may not shoot alone.